Accelerated treatment means a beautiful smile in a fraction of the time. AcceleDent can reduce your treatment time by as much as 50%, whether you decide to beautify your smile with traditional metal braces, Invisalign, clear braces, or lingual braces. The AcceleDent vibrational device can reduce your orthodontic treatment by as much as 50%, with only 20 minutes of usage each day. 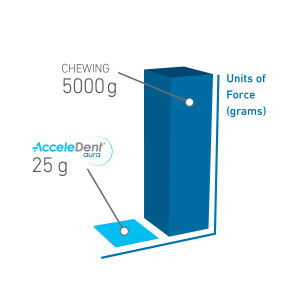 AcceleDent gently works to reduce treatment time by as much as 50% with 20 minutes of gentle vibration every day. Your teeth are held in place by the bone that surrounds the roots of your teeth. Dr. Cooper’s orthodontic treatment actually causes the bone around your teeth to change shape as your teeth move. This is why traditional orthodontic care takes so long – your bones need time to adjust to your new smile. AcceleDent emits gentle vibrations through the mouthpiece that encourage your bone to change shape faster, which allows your teeth to move in less time. These vibrations are actually less powerful than the vibrations of the Sonicare toothbrush included in your care package, or than the vibrations caused by enjoying your favorite meal. Why Should You Ask About AcceleDent? The best part about AcceleDent are the results! Dr. Cooper is seeing incredible results in a matter of weeks with many of her patients. Only 20 minutes of AcceleDent use per day can get your teeth moving, so you can enjoy the beautiful results of Dr. Cooper’s orthodontic treatment sooner than later. You could see those results in 50% of the time required to beautify your smile if you skipped out on AcceleDent. Imagine reducing treatment from 2 years to 1 year or 3 years down to a year and a half! Isn’t 20 minutes per day worth results in half the time? Not only do you see faster results, AcceleDent can also reduce the mild discomfort associated with your teeth moving, so not only does it show you results faster – it makes those results more comfortable. You don’t have to interrupt your day to see these results either. 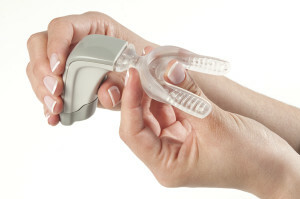 You can use your AcceleDent device while reading a book, checking email, or watching TV. All you have to do is bite down on the mouthpiece and the device does all of the work. You’ll even get a reminder 10 minutes into treatment that you’re halfway there! Find out more about AcceleDent by contacting us or signing up for your free consultation!